EData is the table which contains the election data that I pulled up before. This table contains the State name, the percentage of votes for Gore, percentage of votes for Bush, percentage of vote for all Others and finally the total number of votes. 3) Create a map report of US State from the map gallery and then choose the map visualization as Color Analytical Map. Choose the analytical dataset as Edata and then map the statename in the spatial dataset with the state field in the analytical dataset. Click on Next and then finish to create a basic map report. 4) Even though it is not part of this requirement, I decided to color the states as blue or red based on whether Gore or Bush had got more votes respectively. For this, right click on the Polygon in Map Layers and then click on Polygon Color Rule. Write a simple expression to display blue or red based on who’s got more votes like shown below. 5) Right click on the Polygon layer and then enable the Show Center Points option. 6) Now select the Center Point Marker Rule. Now choose the Marker Type as Image, image source as External and the image as the Marker Url field as shown below. 7) Also, we need to change the size of the pie chart based on Total votes field. For this, change the Center Point Size Rule. Change the size rule option as shown below. Now we should get the basic version of the end result as shown below. 8) After deleting the legends as well as modifying the colors so that my eyes don’t get blinded, this is what I came up with. So aren’t you amazed at the flexibility SSRS gives you? As usual, comment and let me know what your thoughts are on this technique. 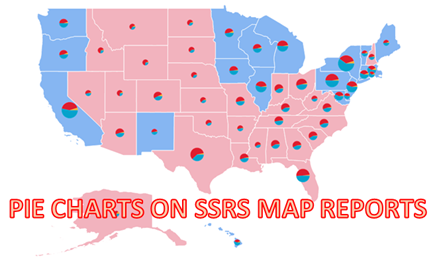 Meanwhile, feel free to download the completed SSRS 2012 report that I made from here. After reading a dozen of yor blogs, I am simply amazed by your talents. I just wanted to express that and consult your blogs as I expand my BI experience. Amazing feature, who would have thought Microsoft and Google would collaberate like this. Next bold question would be of course if you can call a subreport using the markers. For instance a chart or table data. Any suggestions?? Performance might be an issue, but might be worth a try. thanks so much for taking the time to post this nice solutions. I just want to ask you what alternative could be use for the google charts, because this project is deprecated and for long term solutions is not usable. I am trying to embed tables in my report instead of pie charts, without success at the moment. As Paul mentioned, it seems like google changed the API. Do you have any suggestions how to combine the explained proceeding with googles 'new' API (e.g. for column chart: https://google-developers.appspot.com/chart/interactive/docs/gallery/columnchart). I'm looking for another way than adding java script to the report.